Exciting news friends! First of all Happy Wednesday, how’s the weather by you today? 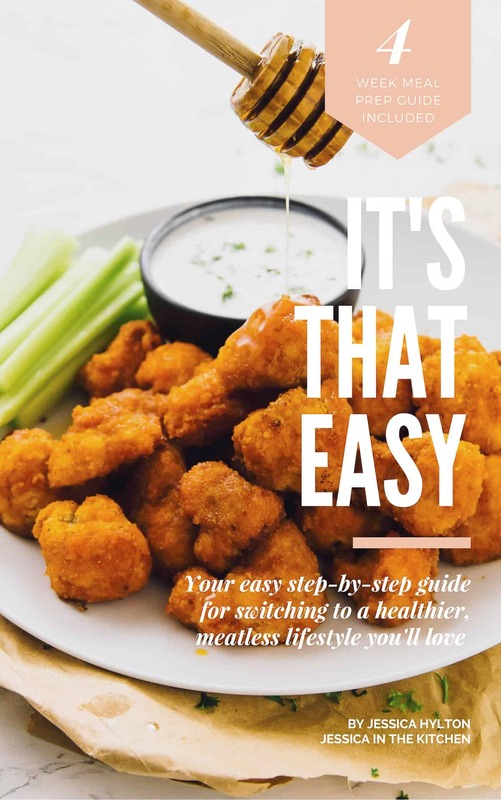 Okay okay, I’ll get into it…I wrote an ebook, and it’s called “IT’S THAT EASY”! I wanted to share some details with you today PLUS allow you to sign up for the VIP early bird pricing list (NOW CLOSED) to receive not only early-bird pricing, but also background information about the creation of the ebook and to even get your feedback while we are finalising details! EARLY BIRD LIST IS CLOSED! The number one reason I wrote this ebook is because YOU asked for it! I’ve been a vegetarian for almost 4 years, and it’s been the best decision of my entire life. In fact, if I didn’t become vegetarian, Jessica in the Kitchen literally wouldn’t exist. Soon after becoming vegetarian, I found that I had an abundance of delicious, healthy food to make, and I wanted to share that with you all on this site, Jessica in the Kitchen. Fast forward to now and every month I am able to share my recipes with hundreds of thousands of amazing readers, and I’ve gotten some incredible feedback as a result. I’ve heard about how eating a meatless diet helped so many of my readers, their families, their elders, and how it really changed the course of their lives. Your stories are endlessly inspiring, please keep sharing them! I’ve answered ALL of these questions for you, and even more. After helping several readers individually, it occurred to me that I needed to make an easy to follow, step-by-step guide to make this process 10x easier for everyone. I’ve done all the hard work for you, because I want you to be able to just start living the life you’ve always wanted to! Honestly this process has been SO exciting. I can’t wait until you’ve opened the ebook and begin!! In fact, I wanted to ensure that putting the proper research into this ebook was my top priority. Even if you aren’t ready to make the switch yet, but want to start incorporating more fruits and vegetables into your life, this guide will definitely help you out. A few months ago, I was approached by a publishing company to write a cookbook. I thought it would be the answer to all your questions, but soon into the process I realised that not only was it so far from the answer, but it would mean all the work I was doing to create this guide for you would have to be put aside. So…I said no to the offer after I realised it just wouldn’t be right for you. Then I decided to put my everything into getting this ebook guide to you. I’ve been working on this ebook for over two years. I wanted it to be the best possible guide it could be for you, so I put in the work, carefully tested every single recipe, and crafted together an easy-to-read guide containing everything you need to know, without being overwhelming. VIP Early-Bird Pricing List – CLOSED! Even better news: I’m opening up my VIP Early-Bird Pricing List TODAY!! A chance to help give your feedback while we are finalising details! I hope you’re as excited as I am! This process has been exciting, nerve-wracking and even intimidating, but it has been SO much fun and I can’t wait until until launch day! I’ll keep updating you on more to come, including a sneak peak of the inside of the book! Is there anything you want to share with me about this ebook process? Any burning questions that you want me to cover in the ebook? Please let me know in the comments section below! Soooooooo excited💃💃💃Can’t wait for release day. Congrats on doing this! Aww thanks so much Toni!! I’m so excited too!! Congrats! Good for you, you did it! I already receive you email and love it! Will this qualify me for the early-bird price? Thanks so much for being a subscriber already!! You would still need to sign up for this specific group so I know exactly who expressed interest! If you want me to I can add your email for you! Otherwise, just click one of the two buttons on this page to sign up! I hope that helps and thanks so much for your interest!! That is so awesome Jessica, congrats on another huge achievement. I have been a vegetarian all my life due to my cultural background but I have never given much thought to the things you touch upon. I can’t wait to get my hands on the book, hopefully it will be released on amazon.com/ca for those of us who are outside Jamaica? Aww thank you so very much!! I can’t wait for you to see the book and thanks so much for your interest in it – it means a lot!! It’ll be available right here on my website via a third party program, so yes you can definitely buy it anywhere in the world! Jessica I am absolutely proud of you and excited to get my hands on your book! Aww thanks so much Yash!! Thanks so much Aunty C! !